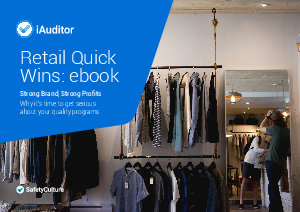 Consistency and customer experience are key to quality and profitability in retail. Manual reporting processes can be unwieldy and time-consuming, but bringing together all compliance procedures under one digital platform means fast, consistent and easy-to-access performance data. Using real-time insights into best practice improves the reporting of quality control, stock loss prevention, inspection processes, logistics and more – saving time, increasing efficiency and boosting customer satisfaction. Benefits include better branding through monitoring rollouts with uploaded photos and videos, protection against shrinkage through improved inspection processes and audits, and clearer visibility of issues which means a speedier response.